Label Description - 80 : Timing Belt and Water Pump Kit with Idler Pulley and 2 Tensioners. Product Description - Extended 240 : 5 Components (1 Belt, 1 Tensioner, 1 Hydraulic Tensioner, 1 Idler, 1 Water Pump). Harmonized Tariff Code (HTS) : 8413309090. Life Cycle Status Code : 4. 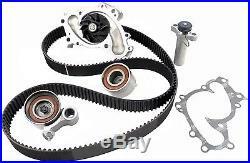 Product Description - Long - 80 : Timing Belt Component Kits W/Water Pumps. See Item Specifics section for additional specifications about this part. To confirm that this part fits your vehicle, enter your vehicle's Year, Make, Model, Trim and Engine in the Compatibility Table. Also review the notes section in the compatibility chart for additional specifications about this part. This part generally fits Lexus, Toyota vehicles and includes models such as Avalon, Camry, ES300, RX300, Sienna, Solara with the trims of Base Sedan 4-Door, Base Sport Utility 4-Door, CE Mini Passenger Van 4-Door, CE Mini Passenger Van 5-Door, CE Sedan 4-Door, LE Coupe 2-Door, LE Mini Passenger Van 4-Door, LE Mini Passenger Van 5-Door, LE Sedan 4-Door, LE Wagon 4-Door, SE Convertible 2-Door, SE Coupe 2-Door, SE Sedan 4-Door, SLE Convertible 2-Door, SLE Coupe 2-Door, XL Sedan 4-Door, XLE Limited Mini Passenger Van 4-Door, XLE Mini Passenger Van 4-Door, XLE Mini Passenger Van 5-Door, XLE Sedan 4-Door, XLS Sedan 4-Door. The engine types may include 3.0L 2959CC V6 GAS DOHC Naturally Aspirated, 3.0L 2995CC 183Cu. V6 GAS DOHC Naturally Aspirated, 3.0L 2995CC V6 GAS DOHC Naturally Aspirated. This part fits vehicles made in the following years 1994, 1995, 1996, 1997, 1998, 1999, 2000, 2001, 2002, 2003, 2004. This item may interchange to the following part numbers from other brands. Brands: GATES Part Numbers: TCKWP257. We distribute Water Pump's. Most cars are originally assembled with parts made by companies other than the one whose emblem appears on the vehicle. We think your vehicle needs 1. A reminder that this listing is for a single Water Pump which may be less than you need for your application. Check the fitment information for the qty your vehicle requires..
Parts Boys have been a family owned and operated business since 1970. Please do not send back cores that are not in one piece. Please take a picture before sending your core back in case we need to verify. Portions of the part information on this page have been provided by WHI Solutions, Inc. The item "Timing Belt Component Kit WithWater Pump fits 1994-2004 Toyota Avalon Camry Sienna" is in sale since Thursday, May 25, 2017. This item is in the category "eBay Motors\Parts & Accessories\Car & Truck Parts\Engines & Components\Timing Components". The seller is "partsboys2" and is located in Bay Shore, New York. This item can be shipped to United States, Canada, United Kingdom, Australia, Japan, South Korea, Taiwan, South africa, Thailand, France, Hong Kong, Spain, Italy, Germany, Austria, Russian federation, Israel, Mexico, New Zealand, Philippines, Singapore, Switzerland, Norway, Saudi arabia, Ukraine, United arab emirates, Qatar, Kuwait, Bahrain, Malaysia, Brazil, Chile, Colombia, Costa rica, Panama, Trinidad and tobago, Guatemala, Honduras, Jamaica.